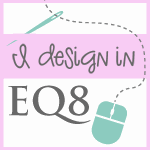 Hello Bloggers, This is my first attempt at designing my own quilt and selection of colours. I have discovered that selection of colours is an art in itself. In this quilt I have gone for a ‘Monochromatic’ colour scheme. That means selecting fabrics from one shade of colour. I first bought the light and the dark pinks and immediately the thought of a pink rose came to mind. From this I selected the block which depicted the centre of the rose and then to complete it I embroidered a rose bud in the centre. What a beautiful embroidery you have created! You not only have a lovely sense of color but also dedication to the delicacies of embroidery as its own artform! Lovely! I love your quilt, very beautiful!